LOS ANGELES — Southern California is fighting a renewed onslaught from the wildfires menacing greater Los Angeles, with emergency crews contending with brisk winds, steep terrain and fatigue from days of relentless work. Schools are closed, roadways are shut and nearly 200,000 people have been told to evacuate their homes. Winds were strengthening on Thursday, with warnings that gusts could reach 80 miles per hour. 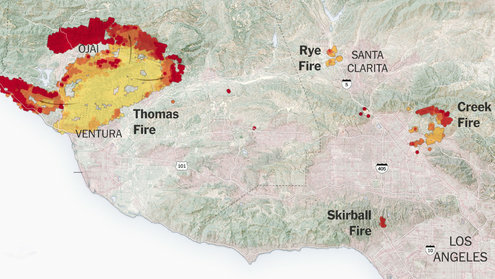 The four largest fires had scorched a combined 116,000 acres in Los Angeles and Ventura Counties by Thursday morning, and none of those fires was close to being contained. “I’ve got to be honest, we’re concerned about everything,” said Armando Hogan, an assistant Los Angeles fire chief. At least two other fires have been reported — one in Riverside County and one in San Diego County. 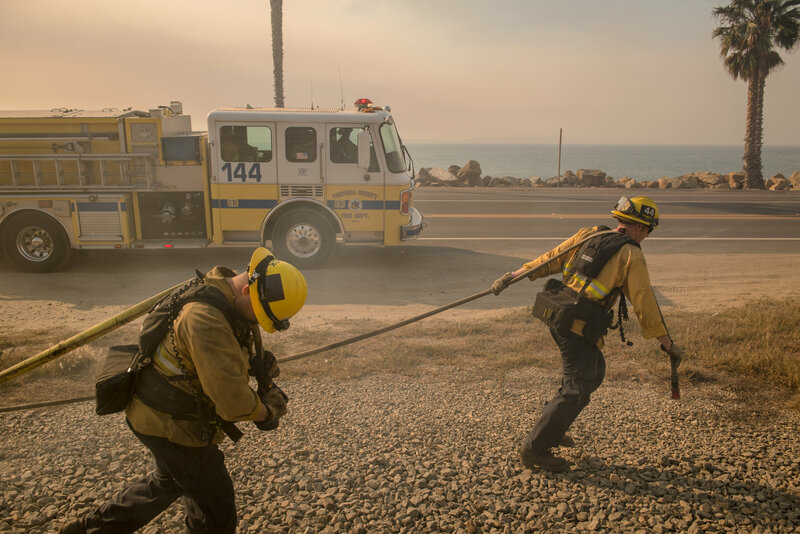 The unfavorable weather conditions have the region on edge, and brush fires broke out Thursday in Oxnard, Malibu, Huntington Beach and in the San Diego area, prompting a quick deployment of emergency crews. Wildfires burned near and in Los Angeles and other parts of Southern California, forcing thousands to evacuate. • The fires in total have destroyed more than 300 homes, businesses and other buildings, and thousands of firefighters have been summoned to help. • Late Wednesday night, officials sent an emergency alert to all of Los Angeles County warning of “extreme fire danger.” The alert was the state’s largest use of a warning system created by Congress and activated in 2012. Here’s what to do when you’re preparing to evacuate. • Fire and smoke forced the closing of the 101 freeway — the main coastal route north from Los Angeles — between Ventura and Santa Barbara. Here is our list of road closures in the Los Angeles area. • Amtrak suspended service between Los Angeles and San Luis Obispo, about 200 miles to the northwest. • Hundreds of schools were ordered closed for the rest of the week because of the thick blanket of smoke filling the skies. The Los Angeles Unified School District said at least 322 schools, including independent charters, did not hold classes on Thursday or Friday. • The National Weather Service, which warned of the risk of “very rapid fire growth,” said winds could diminish Friday into Saturday. Flames spread quickly in the San Diego area. A brush fire in San Diego County on Thursday afternoon had grown to 1,000 acres and was showing “a dangerous rate of spread,” state officials said, opening a fifth major firefighting front in Southern California. Five buildings had been destroyed and an unknown number were damaged, fire officials said. Mandatory evacuations were ordered and roads were closed near Bonsall, roughly 45 miles north of San Diego. The fire started near a country club and quickly grew, state officials said. Crews were battling the blaze from the air and ground. A fire erupts in Riverside County. State and local officials said the fire near Murrieta, in Riverside County east of Los Angeles, continued to grow on Thursday afternoon, reaching 220 acres with no containment by 3:25 p.m. Pacific time. County officials said the brush fire was “burning at a moderate to rapid rate of spread” in an area of “heavy fuels.” Evacuations were ordered in some areas, and about 260 firefighters from several departments were at the scene. There were no immediate reports of damaged buildings. Residents are evacuating as Ojai is ringed by flames. Ojai, a mountain-fringed town known for its unique shops and yoga retreats, was among the areas evacuated in Ventura County, where a fire had burned 96,000 acres with only 5 percent containment. The state firefighting agency said Thursday that “significant fire growth” had been reported north of Ojai, and the state’s fire map showed the community virtually surrounded. Ojai, population 7,500, was among several cities threatened in Ventura County, where 91 buildings had been destroyed as of Thursday morning and 15 more damaged. Around 15,000 more structures were threatened in the county, and about 2,500 firefighters were assisting. Part of the region’s 101 freeway was shut down Thursday morning as the fire reached the highway and edged northwest of Ventura. Officials in Oxnard, in Ventura County, said around midday Thursday that firefighters were battling a grass fire in the city. They said there was no immediate threat to buildings. Read more from people who were at the front lines of the fires here. A ‘miraculous result’ in Los Angeles, but warnings of worse to come. Officials in Los Angeles said conditions were improving on Thursday, but remained precarious in the Bel-Air area, where 475 acres had burned. The fire was only 20 percent contained there and evacuation orders remained in place, though city leaders said a decision on allowing residents back to their homes could be made Thursday afternoon. “We were promised erratic weather, but luckily the erratic weather was erratic in a good way,” said Mayor Eric M. Garcetti, who warned that wind gusts could still hit 70 miles an hour in the days ahead. Four structures had been destroyed and 12 more damaged in Bel-Air, which the area’s City Council member, Paul Koretz, called “almost a miraculous result.” The Los Angeles Fire Department planned to use a drone later Thursday to assess damage and search for hot spots. The Getty Museum, a home to old masters paintings and ancient Roman statues, which closed as the fires threatened the area, said it would reopen Friday. The news and stories that matter to Californians (and anyone else interested in the state). Sign up to get it by email. But officials were reluctant to claim victory, warning that the firefight continued and that conditions remained dangerous. Dousing embers in Bel-Air, and checking on a mogul’s winery. By Thursday afternoon, the focus in the Bel-Air hills had turned to digging out burning embers and cooling down any hot spots that could easily ignite. It was easy to see how quickly the neighborhood could go up in flames: sprawling estates on narrow streets were surrounded by towering elms and bitterly dry pine needles. Blackened embers of tree trunks had tumbled down — one had hit a firefighter and burned him around the neck. Many of the towering iron gates that guard the mansions had been broken open by firefighters who needed to get to the slopes burning below. Some driveways were covered with splatters of pink from the fire retardant that had been dumped from aircraft above. Captain Brian Ferreira, a firefighter from Oakland, had helped mop-up on a hillside near a winery owned by the media mogul Rupert Murdoch. While small patches of the hillside and the wine storage had suffered some damage, most of the winery seemed fine, he said. “Rupert will be glad to hear that, he paid a lot of money for that property,” said Hugh Siegman, 71, who lives just above the winery. Mr. Siegman and his wife returned to their undamaged home Thursday morning, though evacuation orders had not been lifted. “I would rather be here and be vigilant myself and get these guys to help if they need it,” he said. A lack of rain in recent months has raised the danger. California has suffered unusually destructive fires this year. Here’s why. From the deck on the roof of his home in Ventura, Tom Sheaffer has spent most of the week watching the fire move from Santa Paula all the way west to the ocean. Mr. Sheaffer, who was born and raised in Ventura, said he had never seen a fire as bad as this. The strong winds that are driving the fires are a normal feature of late fall and winter in Southern California. What is different this year — and what is making the fires particularly large and destructive — is the amount of bone-dry vegetation that is ready to burn. The situation in Southern California is similar to what occurred in Northern California in October, when high, hot winds fueled fires that killed 40 people and destroyed thousands of homes. But while Northern California has since had a lot of rain that has essentially eliminated the fire threat, the south has remained dry. “We haven’t had any meaningful precipitation since March,” Mr. Rolinski said. A photo caption with an earlier version of this story misstated the city in which firefighters were working to douse embers. It was Ventura, not Ojai.